Unless you’ve been living under a rock, you’ve probably heard that Pudge Rodriguez has been traded to the Yankees for Kyle Farnsworth. I think this was a mistake on the Tigers’ behalf. There’s little doubt that Pudge’s offensive skills are fading as he approaches the end of his career. On the other hand, he is still one of the best defensive catchers in the game – a fact that defies logic, given his age and the wear and tear typically associated with playing behind the plate. Apparently, the Tigers felt that Pudge was expendable. His contract is up at the end of the year, so it would appear that they had no intention of re-signing him. 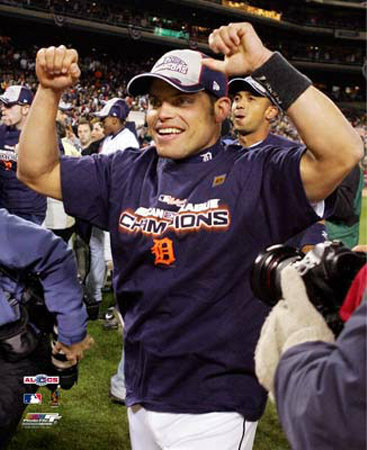 Tiger fans know that Pudge was just more than a 13-time all-star catcher and future Hall of Famer. When he signed with the Tigers following the disasterous 2003 season, it made the Tigers relevant again. In the years that followed, big-name free agents like Gary Sheffield and Magglio Ordonez signed here. Trades both big and small for players like Placido Polanco and most recently Miguel Cabrera brought Detroit an AL pennant in 06 and instantly place them in the same breath as the Yankees and Red Sox. This stunning three-year transition, from the outhouse to the penthouse, would not have been possible without Pudge signing. I got to hand it to the Yankees though; this trade made pefect sense for them. With Jorge Posada out with a season ending surgery, they NEEDED a catcher. At this point, Farnsworth was expendable. Are the Tigers really a better team with Farnsworth than with Pudge? Is Kyle Farnsworth REALLY the answer to the Tigers bullpen woes. (SEE LAST POST). Is Brandon Inge ready or even willing to be the everyday catcher? My gut says “No” to all of the above, but only time will tell.